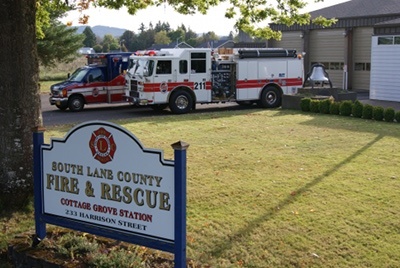 South Lane County Fire & Rescue (SLCFR) proudly serves the cities of Cottage Grove, Creswell, and rural South Lane County. SLCFR was formed July 1, 2003 under ORS Chapter 478 as an Oregon Special District, for the provision of fire, rescue, EMS, and fire prevention services. The District is governed by a five member elected Board and led by the Fire Chief, who is employed by the Board. The Fire Chief is the CEO of the District and all other District personnel work for and under the Fire Chief’s direction. SLCFR is located south of the Eugene/Springfield area of Western Oregon, along the I-5 corridor, in the Willamette Valley. SLCFR operates from four recognized fire stations, and is an ISO Class 2/4/10W, having achieved this rating from ISO on April 1, 2016. 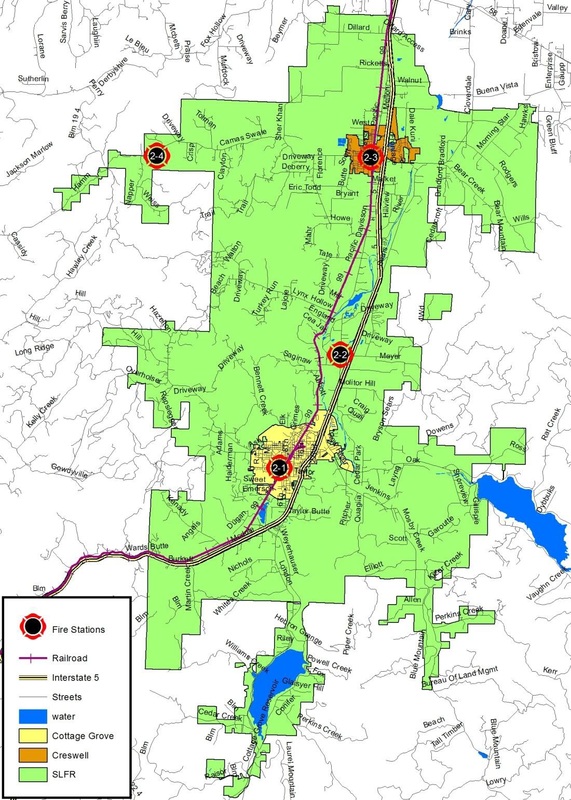 The District serves a population of approximately 25,000, within the 132 square mile boundary of the Fire District. SLCFR provides 24/7 advanced life support transporting ambulance service to an 800 square mile area, including those areas within the Fire District boundaries. SLCFR has a permanent property taxing rate of $1.0335/$1000 of assessed value. The District voters approved an Operations and Staffing Levy of $0.047/$1000 in 2012, which has been crucial in maintaining essential District services. Without the 2012 voter approved Operations and Staffing Levy, the District would be unable to provide advanced life support ambulance services due to forced staffing reductions, negatively affecting station staffing in Creswell and Cottage Grove. SLCFR currently has 21 career operations personnel assigned to three shifts, consisting of seven personnel per shift. Each shift has a Division Chief/Paramedic, Captain/Paramedic, two Engineer/Paramedics, and three Firefighter/Paramedics working 48 hours on 96 hours off duty. The career staff are supplemented by a dedicated force of Resident FF/EMTs and Community Reserve FF/EMTs. The administrative branch of the District consist of the Fire Chief, Fire Marshall (July 2017), and two administrative personnel. The District now handles approximately 11 calls per day, compared to 8 calls per day in 2011.